In order to protect your home base from the dreaded Death Star, you are launched in your X-wing fighter to attack the enemy. As the simulation begins, you are flying "down the trench," the walls of the trench whipping past. The object: destroy the five radiation ports from the Death Star's main reactor. If you succeed, the reactor will overheat and self-destruct, destroying the Death Star. To hit the radiation ports, line up your cursor aiming system, using joystick in Port One, and fire, using the red button. The ports are oval green openings in the bottom of the trench. The Death Star has a full complement of Tie fighters for its defense. The fighters attack one by one, firing furiously. If you are hit too many times, your fighter will explode and crash. To combat the Tie fighters, you'll have to wait till the Tie fighter is in the center of the screen before you can hit it. This game has been improved since it first appeared in ANTIC. It now has a scoring line and two new "endings." David Plotkin is a Chemical Engineer with Standard Oil of California, and a game programmer by avocation. His Attack on the Death Star has been improved since publication, and the new version is printed here in the book. 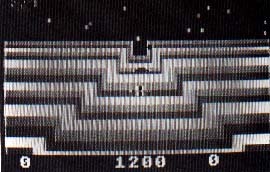 Dave programs mostly in BASIC, but with some assembly language routines, and his games have appeared in several publications, including ANTIC.